Our 2nd International Science and Practice Conference is over and it’s time to summarize the results. 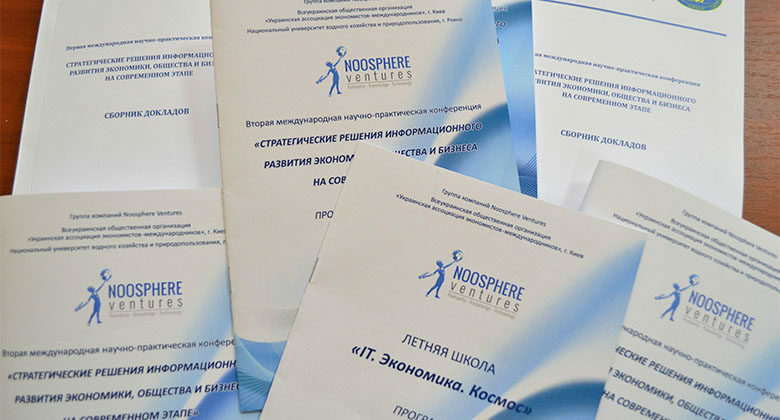 This year Noosphere has gathered about 100 participants including top-managers of big digital companies, leading Ukrainian scientists and students of economics and cybernetics from different Universities. 40 reports were presented during the 8 sections of the Conference and round table discussions on the acute specialized topics were organized in addition to traditional plenary session. The main goal of the conference, devoted to modern solutions intended for information development of economy, society and business, was to arrange a dialogue between scientists and businessmen in the digital economy sphere. Implementing this idea, the Conference is one of Noosphere’ social responsibility projects. Another Noosphere’ initiative pursuing the same goal is the Engineering School – a project to combine knowledge and skills with the evidence-based theoretical basis of leading Ukrainian universities’ lecturers. The first steps in establishing the Engineering School were made within the framework of the Conference. At our Summer School students of different universities and backgrounds had a unique opportunity to communicate not only to the recognized scientists, but also to the industry experts. The three following spheres – IT, Economy and Space – were chosen as the main streams of the School. And the participants were most passionate about the space topics that had been discussed, as the mankind will always dream about the new great discoveries beyond Earth. Darya Skripka, one of our students (Academy of Customs Service, Economics and Management Department), shares her impressions of the Conference and Summer School: «Such a multisectoral Conference is a great opportunity to delve deeply into many vital issues. It is important to discuss problems of modern economy with experts in various fields, to get opinions expressed by different specialists, not only economists and businessmen, but also mathematicians, philosophers, physicists, etc… Sometimes it could be a way to understand things better and open up new opportunities to explore the subject. Science and Practice Conference is not just a standard conference, where discussions are of highly specialized nature. Unexpected metaphors, which I heard from the speakers of the Conference, helped me to look into economic processes in more depth». Overall atmosphere of the 2nd Science and Practice Conference was saturated with a spirit of creativity and scientific vision. We strongly believe that synergy of science and business will be maintained and developed with the help of our future Conferences and other initiatives.